Craving delicious vegetarian fast food? 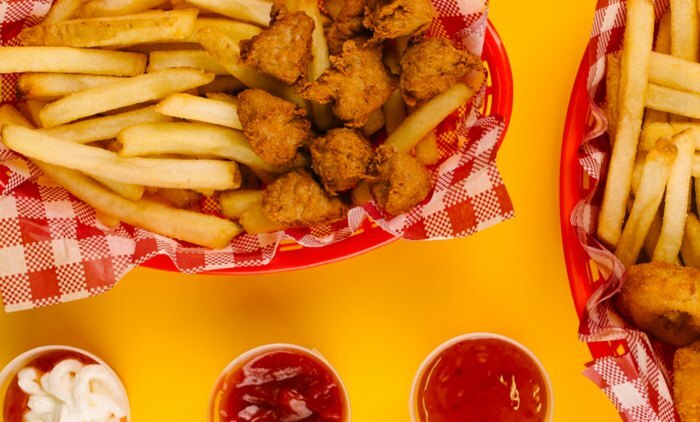 Order vegetarian-friendly hot dogs and fries from a Lord of the Fries restaurant near you. Get Lord of the Fries delivered to your door! "Starting out in 2004 as a food truck traveling the country, Lord of the Fries has since grown into multiple restaurant locations. Co-founders Mark and Mandy saw a gap in the takeout market -- hot chips minus the processed-chemically-treated-and fried-in-animal-fat stuff! If you're vegan or vegetarian, you can finally indludge in a fast food fix whenever the mood strikes. And if you're a meat eater, well, why would you choose frozen-then-deep-fried chips over the real (and very fresh) deal? Offering an amazing vegan, vegetarian, halal, and kosher friendly menu, Lord of the Fries has gotta have the most inclusive menu out there. " "Whatever your diet specification -- or preference -- Lord of the Fries probably caters to it. Vegetarian, vegan, halal, and kosher friendly, this restaurant offers everything from hot dogs, BLTs and hash browns, to veggie burgers and cookies and cream milkshakes. Otherwise known as a guaranteed takeout home run. Log onto the Menulog app or website and within a few taps delicious, healthy fast food could be delivered right to your doorstep! "